One of the great parts of QuiltCon 2016 were the vendors. I bought a lot of great stuff, but I didn't go too crazy, it all fit into my suitcase (which weighed 49 pounds at check-in YEAH!). I bought this adorable kit at Villa Rosa's booth. It is for their Magic Show pattern, made with Purebred fabric. Big surprise...I saw horses and had to buy the fabric. It went together in a flash, literally. I made this in about an hour and fifteen minutes. The fabrics on the pattern were for another line, so I got to choose which fabrics went in which places. Funny, after I made it, I went on to the Villa Rosa website and they had this kit for sale, and they had put the fabrics in the same places! 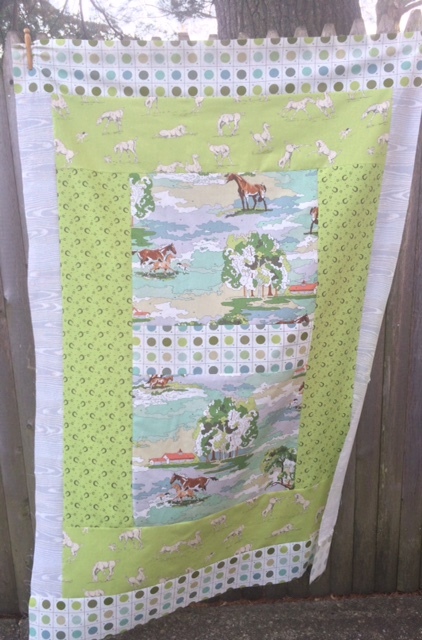 Can't wait to get this one quilted and into my daughter's hands. Quilt measures 45" x 62"